We have seasons because Earth's axis – the imaginary line that goes through the Earth and around which the Earth spins — is tilted. It's tilted about 23.5 degrees relative to our plane of orbit (the ecliptic) around the Sun. As we orbit our Sun, our axis always points to the same fixed location in space. Our northern axis points almost directly toward Polaris, the North Star. This picture shows Earth from its side as it orbits our Sun. The axis is tilted and points to the North Star no matter where Earth is in its orbit. Because of this, the distribution of the Sun's rays changes. In June, in the northern hemisphere summer, the Sun's rays — and warmth — reach all the way to the north pole. In December, in the northern hemisphere winter, the north pole is tilted away from the incoming sunshine. The “fixed” tilt means that, during our orbit around our Sun each year, different parts of Earth receive sunlight for different lengths of time. It also means that the angle at which sunlight strikes different parts of Earth's surface changes through the year. Sunlight striking the surface at an angle is “spread” across a wider area compared to sunlight striking perpendicular to Earth's surface. Areas that receive more scattered sunlight receive less energy from our Sun. All of these factors combine to give Earth its annual cycle of seasons! For part of our orbit the northern half of Earth is tilted toward the Sun. This is summer in the northern hemisphere; there are longer periods of daylight, the Sun is higher in the sky, and the Sun's rays strike the surface more directly, giving us warmer temperatures. The north pole is in constant daylight! When the northern half of Earth is tilted toward the Sun, the southern hemisphere is tilted away. People in the southern hemisphere experience the shorter day lengths and colder temperatures of winter. During winter in the northern hemisphere, our northern axis continues to point to the North Star, but, because we have moved in our orbit around the Sun, our northern hemisphere now points away from our Sun. The north pole is completely dark and other places in the northern hemisphere experience the shorter day lengths and colder temperatures of winter as the Sun traces a lower arc across the southern sky and the Sun's rays strike the surface at a lower angle. When it is winter in the northern half of Earth, the southern hemisphere, tilted toward our Sun, has summer. During fall and spring, some locations on Earth experience similar, milder, conditions. Earth has moved to a position in its orbit where its axis is more or less perpendicular to the incoming rays of the Sun. The durations of daylight and darkness are more equally distributed across all latitudes of the globe. What doesn't cause the seasons? The seasons are not caused by how far Earth is from our Sun. Earth's orbit around our Sun has a slightly elliptical path (very slight! ), and the Sun is not exactly in the center of the ellipse. This means that, during the year, Earth is sometimes farther from our Sun, and sometimes closer — but the difference is small (not so for some other planets!). Earth is closest to our Sun in January (perihelion) and the farthest away in July (Earth is 147.5 million kilometers from the Sun when it reaches aphelion). If distance were the most important factor, the entire Earth would have summer in January when we are closest to our Sun and winter in July when we are farthest away! Solstices occur when Earth's axis is pointed directly toward our Sun. This happens twice a year during Earth's orbit. Near June 21 the north pole is tilted 23.5 degrees toward our Sun and the northern hemisphere experiences summer solstice, the longest day of the northern hemisphere year. On that same day, the southern hemisphere is tilted 23.5 degrees away from our Sun and the southern regions of Earth experience the shortest day of the year — the winter solstice. The second solstice occurs on December 21 or 22 when the north pole is tilting 23.5 degrees away from our Sun and the south pole is inclined toward it. This is the shortest day of the year in the northern hemisphere — the northern hemisphere winter solstice. Twice each year, during the equinoxes (“equal nights”), Earth's axis is not pointed toward our Sun, but is perpendicular to the incoming rays. During the equinoxes every location on our Earth (except the extreme poles) experiences 12 hours of daylight and 12 hours of darkness. The vernal or spring equinox occurs in the northern hemisphere on March 21 or 22 (the fall equinox of the southern hemisphere). September 22 or 23 marks the northern hemisphere autumnal or fall equinox. As Earth orbits our Sun, the position of its axis relative to the Sun changes. This results in a change in the observed height of our Sun above the horizon. For any given location on Earth, our Sun is observed to trace a higher path above the horizon in the summer, and a lower path in the winter. During spring and fall, it traces an intermediate path. This means that our Sun takes a greater amount of time tocross the sky in the summer and a shorter amount of time in the winter. This effect is greater as you move toward the poles; people living near the equator experience only small changes in daylight during the year. The change is more extreme toward the poles. 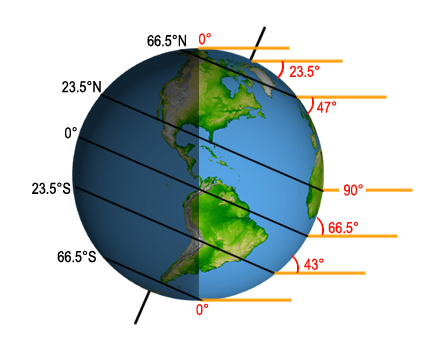 During the northern hemisphere summer solstice, Earth is tilted such that the Sun's rays strike perpendicular to the surface at the Tropic of Cancer (23.5 degrees north latitude, corresponding to the tilt of Earth's axis). At (solar) noon, our Sun is directly overhead in this location (and at a decreasing height above the horizon north and south of the Tropic of Cancer). At locations north, our Sun will be at its highest position above the horizon and will take the greatest amount of time to cross the sky. All northern locations have more than 12 hours of daylight. All locations south experience less than 12 hours of daylight. Locations above the Arctic Circle (north of 66.5 degrees latitude; 90 degrees minus the tilt of Earth's axis) receive 24 hours of sunlight. Locations below the Antarctic Circle (66.5 degrees south latitude) experience 24 hours of darkness. During the northern hemisphere summer solstice, the area “above” the Arctic Circle — above 66.5 degrees north) — receives 24 hours of daylight, while the south polar region is in total darkness. During the northern hemisphere winter solstice, the Sun's incoming rays are perpendicular to the Tropic of Capricorn at 23.5 degrees south latitude. The Sun's path is the lowest above the horizon in locations north of the equator, and these regions experience the shortest day of the year. Between the winter and summer solstices, daylight increases as Earth continues its orbit around our Sun. 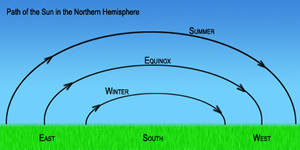 During the equinoxes, sunlight strikes perpendicular to the surface at Earth's equator. All locations on Earth, regardless of latitude, experience 12 hours of daylight and 12 hours of darkness. The spring equinox marks the change from 24 hours of darkness to 24 hours of daylight at Earth's poles . In these extreme locations, our Sun moves above the horizon at the spring equinox and does not go below the horizon until the fall equinox. Do other planets have seasons? Yes! Other planets in our solar system experience seasons for the same reason Earth does; their axis of rotation is tilted. However, some planets — like Mars and Pluto — have elliptical orbits that result in more extreme variations in distance from the Sun as they revolve around it. This, combined with the axial tilt, causes greater seasonal variation. Uranus has an extreme tilt of 82 degrees. It takes Uranus almost 84 Earth years to complete its nearly circular path around the Sun. The tilt means that the pole of each hemisphere is exposed almost directly to the Sun's rays during the summer solstice, and the opposite hemisphere is in constant darkness. Given Uranus' long period of orbit, this translates into a 20-year winter or summer! *Summer solstice refers to the time the north pole of a planet is tilted toward the Sun. Based on data from 1990.